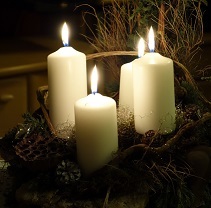 Join us for our annual Carols by Candlelight on Wednesday 19th December at 1pm and 6pm, followed by mince pies. Singing Charles Wesley’s “Hark the Herald Angels Sing” in the building where it was originally sung in the 18th Century, alongside other traditional and contemporary carols to celebrate the Christmas Story. We hope to see you there. The New Room community choir will be performing during the service at 1pm. For more Christmas events at the New Room, visit the events page here.